Five years of touring and recuperation have yielded a superior record than SATYRICON‘s 2008 release, Age of Nero. In the spirit of progress, SATYRICON explores new territory with their new self titled record. The first half of Satyricon may catch many by surprise with its decidedly subdued, sublime style. A stripped down, straight forward feel comes with the mostly single string riffs. The band also employs plenty of their distinctive melodies. For lack of a better word, one could describe this as SATYRICON at their “doomiest,” especially opening track “Voice of the Shadows,” which sounds like a ceremonial exhumation of a pharaoh’s tomb. A gem in the band’s catalogue is “Phoenix,” featuring vocals by Sivert Høyem of Norway’s MADRUGADA. It’s not just the first SATYRICON song to exclusively have clean vocals but it’s downright good. It’s gloriously powerful and ranks as one of the band’s best songs. Side A is not about traditional metal notions of heaviness or aggression. The silence and quietness of it all creates a thick, heavy atmosphere. This is a new side to the band and some may find it off-putting. Side B sees some of that SATYRICON speed and aggression but on average, it does not get faster than Diabolical, Now or Age of Nero tempos. “Walker Upon the Wind” and “Ageless Northern Spirit” feature that good old, biting aggression of latter day SATYRICON. “Nekrohaven“‘s hooks catchy in a punk/post-punk way. Without a doubt, “The Infinity of Time and Space” is the centerpiece of Satyricon. The classic sound of the first three records meets the sound of the last few albums in quite a soulful journey. The song perfectly captures the essence of the band – that strong will and the inexorable Norwegian black metal spirit. Closing track, “Natt” (“night” in Norwegian), brings it all back to folk era of the band and serves as a great closing instrumental. Listen carefully for the whispers. Norwegian black metal conjurers NIDINGR have posted the second single, “Vim Patior,” from their new full-length, Greatest of Deceivers. NIDINGR’s Greatest of Deceivers is scheduled to detonate in North America on November 20, 2012. 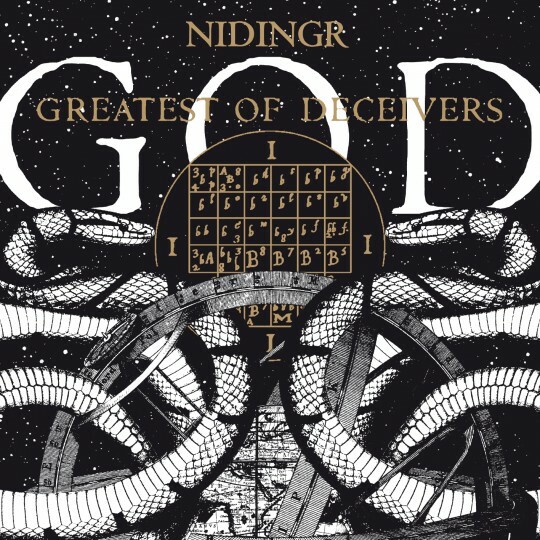 Norwegian black metal band, NIDINGR, will unleash their new full-length, Greatest of Deceivers, in North America on November 20th. The follow up to Wolf Father features present and past members of bands such as MAYHEM, GORGOROTH, DHG (DØDHEIMSGARD), 1349 and GOD SEED, among others. NIDINGR recorded G.O.D. in Crystal Canyon Studios in Oslo, home to a host of prominent Norwegian acts including cult experimentalists ULVER, to accomplish a unique ‘70s, vintage style production. The sound they’ve created is a wholly organic, warm, unedited and un-triggered production that further emphasizes the great musicianship caught on tape. Greatest Of Deceivers was produced by guitarist Teloch, mixed by Anders Møller (KITCHIE KITCHIE KI ME O, EUROBOYS, 120 DAYS, TURBONEGRO, etc.) and mastered by Jaime Gomez Arellano at Orgone Studios. A new generation of Norwegian black metal is alive and well thanks in part to THE KONSORTIUM. Lead by prolific guitarist Teloch (MAYHEM, NIDINGR, UMORAL), the band effortlessly rips through their debut full length. At the heart of THE KONSORTIUM‘s sound is the foundation of (keyboard-less) Norwegian black metal, ranging from the blasting to the mid-paced (i.e. MAYHEM‘s De Mysteriis Dom Sathanas, KHOLD). Mixed into the action is a significant injection of aggressive thrash that meshes seamlessly as well as touches of Norwegian avant garde black metal. The latter characteristic is embodied in ARCTURUS-like theatrical vocal stylings. The chanting, spoken words, screams, and shouts all work to help the album stand out. Overall, the album is completely guitar driven, which turns out to be a good thing since there is an abundance of good riffs. Teloch throws in plenty of subtle guitar tricks and embellishments in his playing to further add distinction to The Konsortium. Songwriting-wise, the record is solid. There is plenty of variety within the context of the band’s sound. A song can go from slow and grim to blast beats to melodic without any discontinuity. Despite the fact that Norway is no longer the “big” thing in metal does not mean that the nation is lacking in a new generation of black metal bands. With a five year hiatus between their debut release, Sorrow Infinite and Darkness, and their brand new album, Wolf-Father, NIDINGR has quickly gained ground in the hierarchy of new Norwegian black metal bands. Wolf-Father is distinctly and proudly Norwegian with its high frequency raging guitars, precise blast beats, and black feel. However, do not mistake NIDINGR for sounding old or derivative as they manage to give a fresh take on the famous Norwegian black metal sound. Teloch (1349, ORCUSTUS, GORGOROTH) and Blargh (DØDHEIMSGARD) dish out the catchy, and, often, simple riffs that are not too far removed from bands such as 1349, DØDHEIMSGARD, and THORNS. The guitars in particular have a sweet resonance, and the perfect tone that you want for this type of metal. Vocalist Cpt. Estrella Grasa’s shouts and proclamations are reminiscent of Aldrahn (THORNS, ex-DØDHEIMSGARD) in a good way. Drumgod Hellhammer lays down his usual top-notch performance that, at times, seems too easy for him to run through. “Baldrs Draumar” explores a different vibe with its doomy section featuring ULVER’s Garm on vocals. 1349 is a band that has flown under the radar for years now, despite having one of the most skilled drummers in the world – Frost of SATYRICON fame. Even their Norwegian brethren KEEP OF KALESSIN have grown more popular than these blast masters. While 1349 turned off a large percentage of their fan base with the experimental Revelations of the Black Flame album, Demonoir returns to proper form with unrelenting, ugly black metal, the way it’s supposed to be. As with Revelations of the Black Flame, Demonoir features ambient tracks, but the ambient passages on this album should be looked at as completely separate “music” from the actual songs. This works to 1349’s advantage as the flip flop of ambient tracks and regular songs breaks up the speed and intense battery of Frost’s hellfire to avoid the monotonous blast formula as evidenced on some MARDUK releases. Demonoir consists of seven ambient parts which alone make up an amazing horror soundtrack, as well as the six actual songs to assault the ears with. Hints of Beyond the Apocalypse and Hellfire can be found in “Pandemonium War Bells,” but these riffs still sound fresh and Frost’s use of the high hat and ride cymbals are best heard when listened to at maximum volume. “The Devil of the Deserts” shows where SATYRICON would be if they continued with the style of writing as witnessed on Nemesis Divina – great riffs, balanced with the brutal machine gun blastbeat attack is definitely not for the faint of heart. Although the piano piece is oddly placed at the end of the track, it creates an atmosphere fitting to lead into the last track, “Demonoir.” The final opus slows down the pace, and takes the approach of latter SATYRICON-era riffs – the simplistic yet heavy riffing that would make even Satyr jealous. Demonoir, the fifth full length from Norwegian black metal titans, 1349, is now streaming in its entirety here. The album will be released in North America on April 27th via Prosthetic Records and was recorded at Studio Nyhagen, deep in the woods in Norway with Tom G. Warrior serving as co-producer. 1349 are currently on tour with CANNIBAL CORPSE in North America.